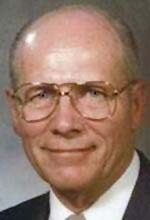 Milo G. "Mike" Balhorn, 84, of Waterloo died Thursday July 19, 2007, at Covenant Medical Center. He was born April 28, 1923 in Keystone, son of John and Pearl Struve Balhorn. He graduated from Waterloo East High School in 1940, among other accolades he was a state wrestling champion. He served as a captain in the U. S. Army Air Corps in the China Burma Theatre during WW II. Mike and Dorlis J. Witt were married on July 18, 1946 in Waterloo and celebrated 61 years of marriage this year. He was employed with Bopp Manufacturing which later became Waterloo Unloader. He was an inventor of many heavy equipment machines and held patents on a cement block machine and a cement block pallet-cleaning machine. He was involved in sales and service and was a consultant of his inventions. He was a member of American Legion Post 138 for 51 years and the Waterloo Elks for more than 40 years. Survivors include his wife; three daughters: Jean Ann (Tom) Agle of Houston, TX, Lynda (Gil) Walsh of Huntley, IL, and Barbara Glessner of Waterloo; seven grandchildren; 10 great-grandchildren, and a brother Vincent S. (Pat) Balhorn of San Antonio, TX. Services will be 1:30 p.m. Monday at Hagarty Waychoff Grarup Funeral Service on West Ridgeway with burial in Garden of Memories Cemetery where full military rites will be conducted by American Legion Post 138 and Veteran Of Foreign Wars Post 1623. Public visitation will be from 2:00 5:00 p.m. Sunday at the funeral home and for an hour before services on Monday. Memorials may be made to Cedar Valley Hospice or Covenant Foundation.